Skin peels are back and Bella Thorne is bang on trend! Chemical peels have also resurfaced as a popular treatment choice. According to statistics from the American Academy of Facial Plastic and Reconstructive Surgery, more than half of facial aesthetic surgeons polled (52%) say that chemical peels are in high demand. And for good reason – they can improve acne, correct age spots and discoloration, boost tone, get rid of fine lines (especially under the eyes and around the mouth), and repair the damage thanks to too many hours spent in the sun. Skin peels are among the top most-wanted facial rejuvenation products on the market, along with Botox, dermal fillers, laser surfacing treatment, and micro-dermabrasion. A non-toxic chemical solution is applied to the skin to remove the top layer and encourage cell renewal and stimulates collagen production. This ‘quick fix’ treatment is a minimally invasive dermatology procedure and has little downtime. It can give skin a boost and you a more youthful appearance. 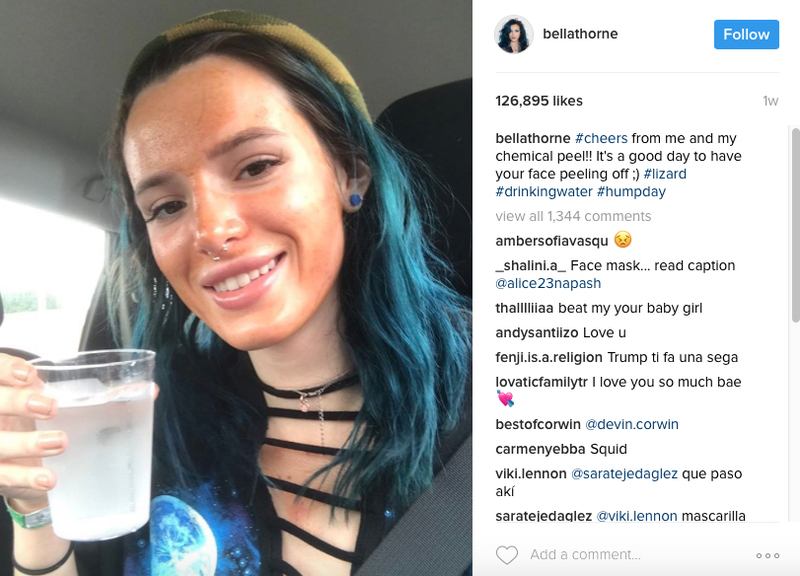 Only recently, American actress Bella Thorne revealed her chemical peel passion by posting an Instagram pic of the treatment immediately afterwards. Like her, you’ll have shedding, flaking and red skin for a few days post treatment but the condition and appearance of the skin will improve. Following a chemical peel, we’re advised to avoid time in the sun and use a high sunscreen even on days with cloud cover, quit using facial scrubs and loofahs and don’t be tempted to pick at the peeling skin – like Bella Thorne! Dr Leah Totton’s clinics offer DermaQuest’s range of luxury peels. Rich in botanical stem cells, peptides and vitamins, their hydrating and protective ingredients are vital for transforming, reviving and rejuvenating your winter skin. And, do you know one of the things that contribute to their popularity? There’s a peel for everyone. They can address a wide range of skin problems, freshening skin, improving its appearance and can even achieve limited tightening, plus it’s an evidence-based, result-oriented, and cost-effective procedure, according to research. You can find more information on our treatment page here. According to Glamour magazine, everything’s coming up lasers, too, thanks largely to the Kardashian effect – with the social media-mad reality stars convincing us all that cosmetic treatments can bring out the best in us. Lasers can tighten and improve many areas of our bodies, from wrinkly necks and tired, lined eyes to hair removal, tattoo removal, scar therapy and skin resurfacing. And the technology – along with its results – has come on leaps and bounds of late. Check out the laser skin resurfacing treatments here.